The charcoal grill is the restaurant's key focus, both its form and function, complimented by an extensive 3000 bottle cellar that houses over 500 varieties from Australia and world-wide regions. The kitchen is led by Executive Chef, Brent Assam and Julian Nicolas who has designed a menu to highlight the quality of the ingredients using a variety of cooking methods including the feature charcoal grill and rotisserie. To start we enjoyed a selection of delectable entrees. Everything wonderfully fresh and expertly prepared. The dish of scallops was delightful. Perfectly cooked pan seared scallops were served with luxurious beurre noisette, cauliflower and chorizo crumb for just the perfect kick of salinity. The duck breast served with duck fat oats and plums was similarly delicious. The slices of duck breast were cooked to a rarely found perfection allowing the rich flavour of the duck to shine through. The sweet and sticky jus provided the crowning element to a luxurious dish. For mains, the Thornby lamb rack was perfection The lamb was roasted to a tender and juicy pink and was exceedingly flavoursome and worked wonders with the accompanying smoked eggplant, shallots, fenugreek and beetroot. A visit to Coal Cellar + Grill would of course be incomplete without devouring one of their amazing steaks. On this occasion, we enjoyed the rib eye on the bone (400gm). Like most high-quality cuts, it was best cooked rare to medium. Displaying a mastery in the manner the steak was cooked, it was cooked perfectly from end to end. A light searing ensured that the steak was lined with a thin crisp outer layer packed with caramelised beef flavour. We loved the wine match for this course – 2012 Dominic Versace Limited Release Shiraz from the Adelaide Hills, SA. It was a wonderfully opulent, intense and plush wine that went perfectly with both the lamb and the steak. Our evening concluded on a sweet high with a duo of moreish desserts. The Mango sansrival was light and refreshing. 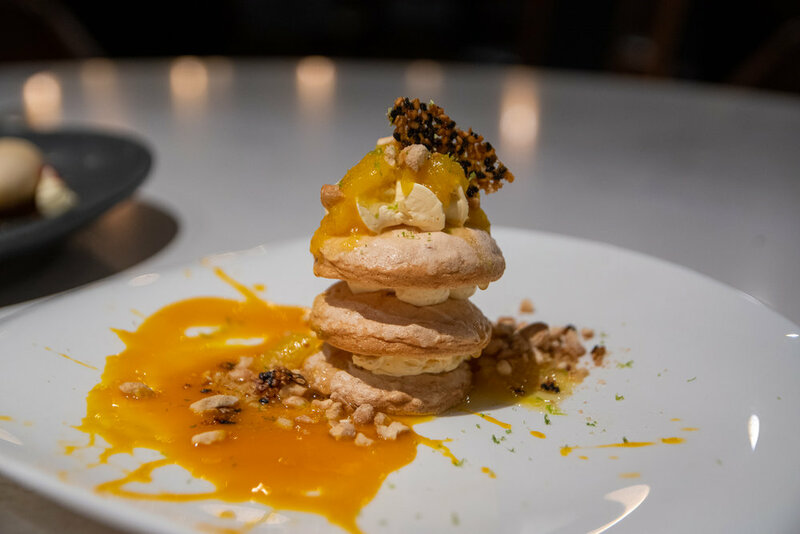 Cashew dacquoise was served with mango and lime compote, luxurious vanilla butter cream, sesame seed tuile for a textural counterpoint and mango coulis. The vanilla bean panna cotta served with Magarey poached pear, pear sorbet, honey cream, ginger streusel and candied walnuts was similarly delightful. A texturally perfect rendition, the pannacotta was silky smooth. Just barely holding its shape, it was quivering on the plate. Hilton Adelaide's Coal Cellar + Grill transports you on a culinary journey through South Australia's finest produce matched with wines from the region to create a memorable dining experience.